Our first Imaginative Learning Project this term was called Gods and Gladiators and we learnt all about the Romans and the people who lived in Britain before the Romans: the Celts. We visited the site of the Roman Legionary Fortress at Caerleon on Monday September 23rd. 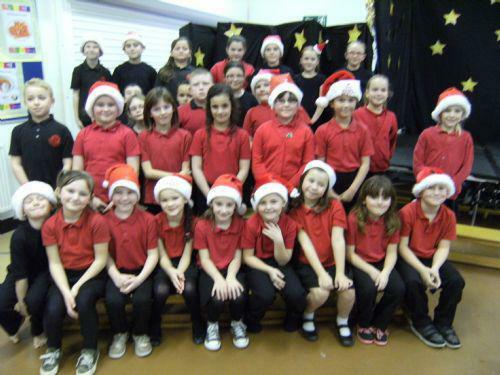 Take a look at more photographs in the Caerleon section below. By visiting these websites you find out information about the Celts, the Romans and Gladiators including dressing one ready for the Amphitheatre. Year 3 will be having P.E. 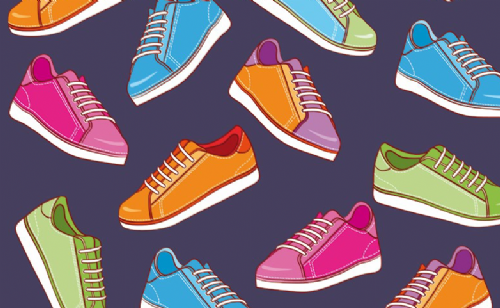 on Thursdays and Fridays so remember your kit including trainers! And leave those earrings at home! We have been learning about Roman Gods and Goddesses and how the Romans prayed to them and gave them gifts. We found out that the planets were named after the Roman Gods like Mars the God of War and Venus the Goddess of Love. We invented our own Roman Gods and tried to persuade Jupiter to let our God join his Council. We drew our own symmetrical patterns and use these ideas to create Roman Mosaics. We designed and made a gift for Jupiter: a Mirror decorated with a Mosaic Pattern. We have been measuring in centimetres and learning how to convert metres into centimetres and vice versa. We have collected data and drawn tables using tally marks and interpreted pictograms. We have really enjoyed our project Gods and Gladiators and even created a dance based on the activities that took place in an amphitheatre. Now we are all looking forward to a well earned Half Term break! 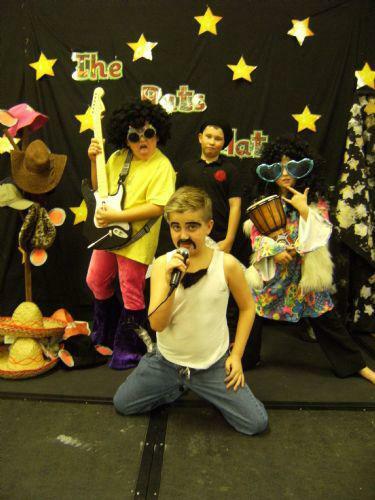 Our actors enjoyed getting into their parts and they certainly were very talented! We learnt how to write our own stories in our Language Sets and are continuing to practice joining up our letters. We have had an exciting time learning about the Romans as part of our project Gods and Gladiators. We have been finding out about life as a Roman Soldier and had a great time visiting the site of the Legionary Fortress at Caerleon. 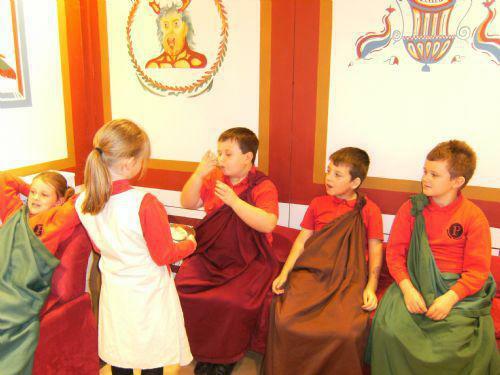 We also found out what Romans ate and enjoyed acting out the roles of Masters and Slaves at a Roman Feast. We have learnt about the Roman invasions of Britain in 55 and 54 BC and in 43 AD and placed events in the history of the Roman Empire on a timeline. Now we are finding out about the people who lived in Britain when the Romans invaded - the Celts. To find out more about the Celts why not visit the websites listed above? In Welsh we have been learning about Y Corff. Can you remember the Welsh words for some of the parts of the body? We were visited by Claire from the Dogs' Trust last Friday who told us all about looking after our pet dogs. This Friday we were visited by the Brass Teacher and we had a try at playing a brass musical instrument. Year 3 children can have lessons to learn to play a brass instrument, if they wish. But places are limited, so return your consent forms as soon as possible! We have been learning to join up some of our letters in handwriting. Look at the Homework section below to access the practice sheets for this week. Our number work has been to add and subtract 1 10 and 100 to 3 digit numbers. Extra practice of this has been sent home as homework. We will be using our number bonds to 10 next week so this week's homework is a game which helps practice these. All maths homework can be found in the Homework section below. 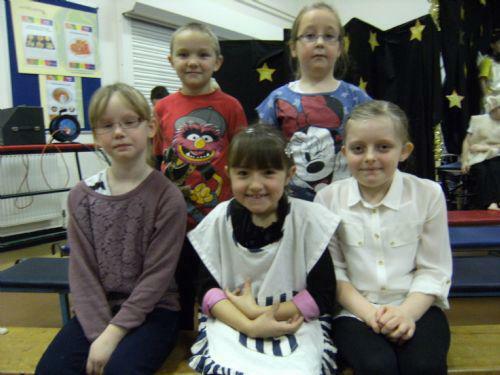 In the Innovate Stage children apply their skills and understanding by designing their own range of sportswear and creating a range of different types of adverts for marketing purposes. We worked hard creating a Christmas tree in cross stitch and then decorating it with beads and tinsel. We hope they liked them at home! On Thursday we had our Christmas Party and we all dressed up and had a great time in the disco and playing pass the parcel. We had lovely party food including ice cream! We lit the Christingles we made and took them into a special assembly on Friday and explained to the whole school what each part represented. We had a great Christmas Singalong in the hall afterwards and were entertained by both the School choir and the Staff choir with many of the teachers wearing Christmas jumpers! So all that remains is to wish you a Merry Christmas and a Happy New Year and hope you have a fantastic Christmas Holiday and we will see you all on Monday 6th January 2014. We have been very busy learning the songs and practicing our Christmas Play The Rat's Hat with the children of Years 4 and 5. Mr Blumberg wrote special music for the songs and we really enjoyed performing them to the whole school at our dress rehearsal on Wednesday and to the parents on our first adults only performance on Friday. We think everyone enjoyed themselves! Some of us were sheep who not only talked but danced as well, much to the amusement of the audience! 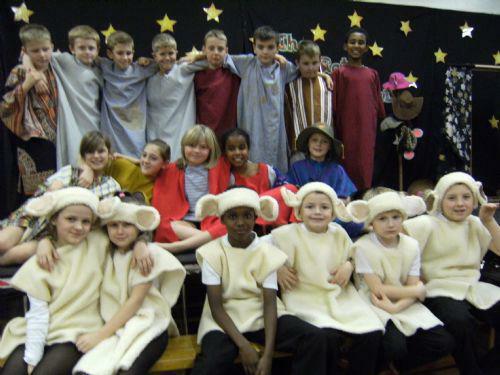 The Year 5 shepherds had a hard time looking after us! 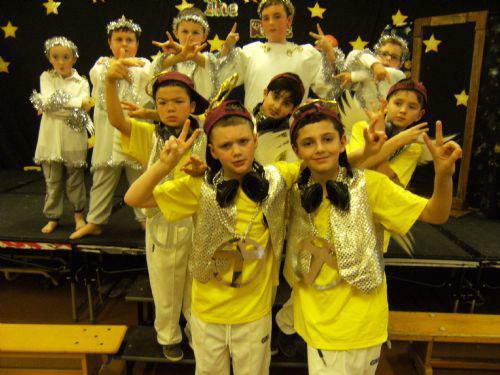 Some of us were angels and supported the Year 5 angel rappers as they told the shepherds what was happening in Bethlehem. 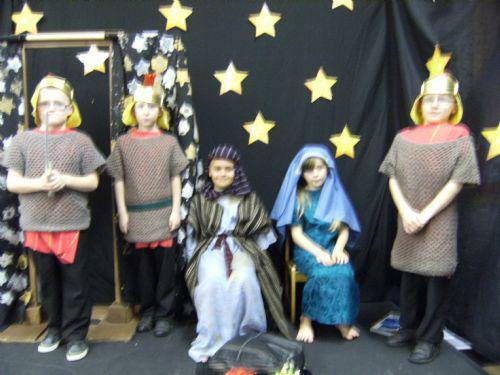 We also played the parts of the Roman Soldiers who made Mary and Joseph make their long Journey to Bethlehem. Some children had an important scene in the play making the main character Fred the baby rat jealous of the way they played nicely together. Many Year 3 children sang in the choir and had lots of songs to learn. More photographs of the characters in The Rat's Hat can be seen in the Folder below. In between all our rehearsals we learnt our 2 times table and how to use the facts to multiply and divide and we found out how to find a fraction of a number. We also read out our favourite poems and wrote our own poems using our senses. We found out about the importance of light in many religious ceremonies and how candles are used in different religions. We learn about the meaning of the christingle and will be making our own using an orange or tangerine. 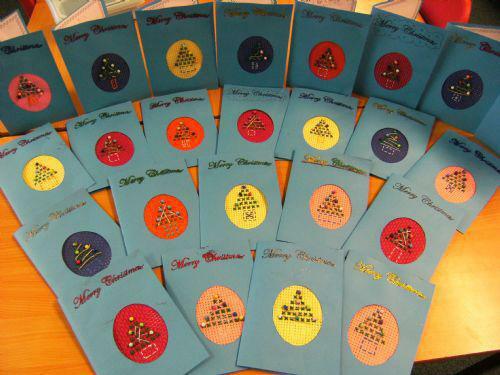 We have been practising own skills in stitching and are making very special christmas cards to take home. Our last performance of the Rat's Hat is on Monday afternoon and then we can look forward to our Christmas Party on Thursday. 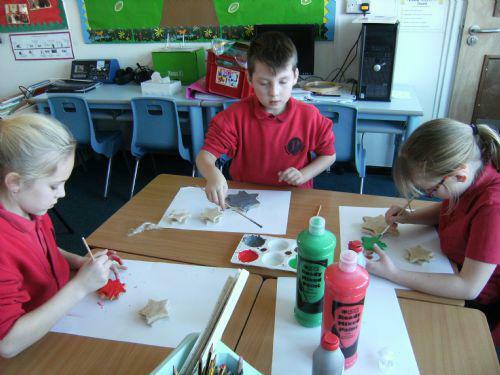 It has been another busy fortnight for us all in Year 3 where we have learnt new skills and been very creative in making items for the school's Christmas Fayre on Thursday. 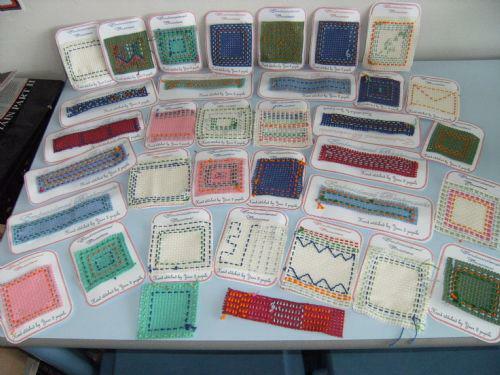 We learnt how to sew with the help of some kind mums and nans who came into school to share their skills. We rolled out salt dough and cut out star shapes and painted and glittered them to make candle filled table decorations. 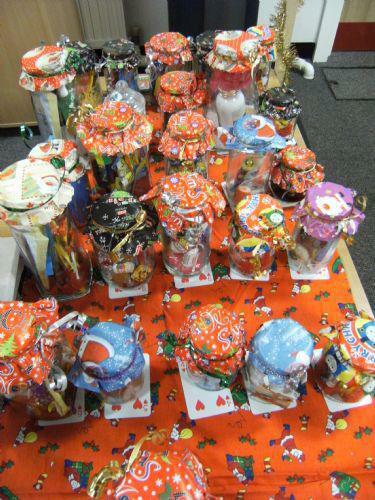 We helped Mrs Wheeler fill the Jolly Jars with sweets and toys and filled up the knitted Christmas Stockings with lots of goodies. 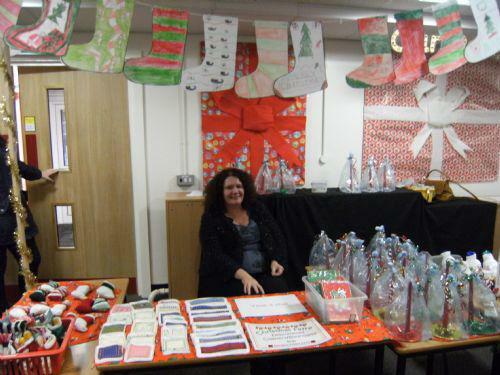 To see more photographs of our work look in the section below on the Christmas Fayre. We have also carried on with our science experiments on materials trying to find out which materials are the best insulators. We have some very talented artists in Year 3 as we are sure you will agree! We have been studying lots of different types of advertisements both on television and in magazines as part of our project and have identified many of their features and produced some of our own. We also have been looking at what we need to do to ensure we have a healthy lifestyle and we are looking carefully at not only what we eat and drink but how active we are each day. And of course we have started practicing our words, songs and dances in preparation for our Christmas Concert, The Rat's Hat on the 11th, 13th and 16th of December! Don't miss it! 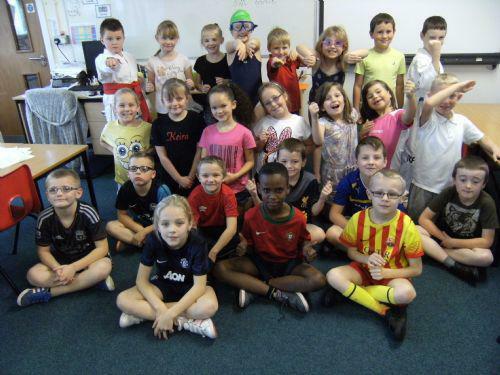 We have had a very busy and exciting fortnight working on our new topic Sportswear Designers and taking part the Monster Ball and Children in Need Spotty Day. We had some difficulty at the Monster ball working out who were our teachers. See the Monster Ball section below to see who you can recognise. To start our new project we watched lots of sporting events to find what clothing was being worn by different sports people. Then we had a Sportswear Day. We wore a variety of sportswear from football kit to swimwear and interviewed each other about what we were wearing and why it was suitable for that sport. We also looked at what materials the clothes were made out of. We learnt the names of many clothes in Welsh and described what each other were wearing in Welsh! We then used our IT skills to insert the photographs into Word documents and our word processing skills to describe what was being worn in Welsh changing the size font and colour of our writing. We were scientists testing materials for important properties like being waterproof, windproof and stretchability. We also learnt about temperature and why we need a thermometer to measure the temperature as we are not good at measuring temperatures ourselves as we found out in our experiment with three bowls of water. We had to learn how to read the temperature on a thermometer and we went all over the school outside and inside measuring how hot and cold it was. We found out that the IT suite was one of the hottest places in the school at 25 degrees Celsius! We looked at what we were wearing for our PE lessons both indoor and outside and discussed how suitable it was for Gymnastic lessons and outdoor Games. You can see more photographs of our body shapes and movements in the Gymnastics section below. We invited a fashion designer into school to talk to us about how she designed an outfit for riding. She showed us her designs and samples of the materials she used. We examined the riding outfit and even had a chance to try it on! We have also been learning about how to create our own advertisements and can't wait until next week to start designing our own sportswear and advertising them! We have put together a pack of homework for your child to complete over the half term holiday. There are practical science activities that they can carry out as part of our Literacy work linked to Cloudy with Chance of Meatballs 2 and the entry form for the Competition to write a story based on the work we have started in school. For more details see the website: www.nationalschoolspartnership.com/cloudy2. There are also Maths worksheets and activities, handwriting practice, and the list of high frequency words that they need to be able to read and spell. Please can you ensure that you child spends a little time each day attempting these activities and returns the completed ones to school in the week after half term? Please can you also encourage your child to read, and spend a little time over half term hearing your child read? Copies of the homework sheets can be found on the Homework section below.